For those who are interested in purchasing platinum, it’s vital to choose the right type of bullion. PAMP Suisse Platinum Bars are recognized worldwide as one of the most trusted bullion bars. 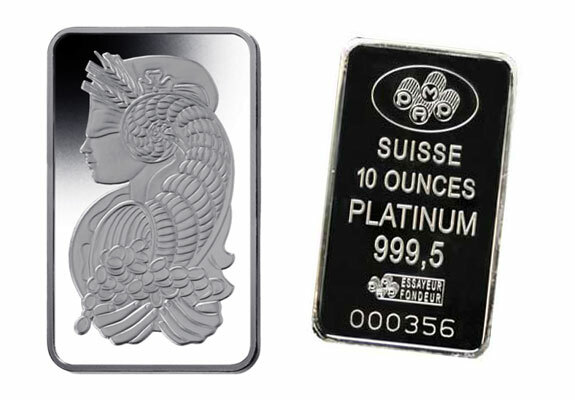 Many PAMP Suisse Platinum Bars feature one iconic motif – the goddess Fortuna. The obverse (front) side of most PAMP Suisse Platinum Bars showcases the Lady Fortuna design that has become a world-renowned sign of quality and authenticity. The goddess of fortune and prosperity is portrayed with attributes such as sheaves of wheat, a horn of plenty, and precious coins. The reverse (back) side displays the PAMP logo as well as the weight. The bars are assayed and guaranteed to be of a .9995 fineness level as clearly displayed on the bar. PAMP stands for “Produits Artistiques Métaux Précieux”, or “artistic precious metals products” in English. Established in 1977, PAMP is one of the world’s leading bullion brands. With services including precious metal pricing, physical trading, and daily market reports as well as clients ranging from central banks and government mints to bullion retailers, it’s easy to see why PAMP produces only the highest of quality products. The design pictured above is the most common for PAMP Suisse Platinum Bars. They are also minted in a “Liberty” design. PAMP Suisse Platinum Bars are some of the most iconic forms of platinum one can own, however outside of the technical specifications there are more reasons to own platinum. Taking platinum’s track record over the previous decade into consideration, it’s no wonder investors are eager to own this type of bullion. Overall, precious metals such as platinum can help protect your wealth against inflation. As the dollar devalues, many investors look to precious metals by turning their paper assets into physical bullion. For more information about owning PAMP Suisse Platinum Bars in your IRA, tax-free and hassle-free, call American Bullion at 1-800-326-9598 to speak with a precious metals specialist.